Timing their tasks up to and beyond re-entry was important to help the crew to coordinate their progress through an increasingly busy checklist. To this end, they set their digital event timer to count up to, and beyond the moment of entry interface. Their next task was to prepare the EMS by setting it to the starting conditions for re-entry, as read up in the PAD. The CMP moved the scroll to the start of the relevant monitor pattern required for the upcoming re-entry, aligning the scribe to the expected velocity when the 0.05-g switch would be triggered. The total distance for re-entry was entered into the digital display at the bottom of the panel and the dial of the roll indicator was aligned to ensure that its reference matched the GDC and that it would accurately show whether the CM was oriented feet-up or feet-down. Both rings of the command module's RCS were operated for a short period to check their proper operation. To achieve this, spacecraft attitude control was transferred to the CM and the thrusters on both rings were exercised. 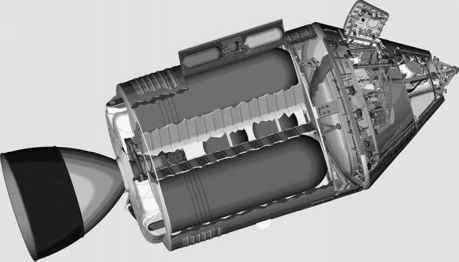 Once complete, attitude control was returned to the SM thrusters. With just 25 minutes remaining before reaching entry interface, the crew began to prepare the service module for jettison. A valve was closed to cut off the supply of oxygen from the SM tanks, leaving the CM reliant on the contents of a small tank mounted in its periphery. One of the three fuel cells was shut down to force the batteries to take more of the load and help to warm them up. The crew switched off the service module's radio systems. Circuit breakers were pulled to remove power from heaters for the radiators, the dump nozzles and the potable water tank. Once all these small tasks had been completed, a check was made to ensure that the spacecraft was still in the correct attitude for their horizon check and CM/SM separation. They then started work with the computer. Use of the computer was quite intensive during re-entry, especially since, if all was working well, it would be the computer that would fly the spacecraft all the way to deployment of the parachutes. Computer work began with Program 61 which started re-entry navigation by measuring the acceleration acting on the spacecraft. It also accepted relevant information from the PAD to allow subsequent programs to control the re-entry. This included their planned impact latitude and longitude and whether they would be entering heads up or down, information that went into Noun 61; their maximum deceleration, their velocity and flight path angle at entry interface went into Noun 60. They then checked the contents of Noun 63, which held their range from the 0.05-g point to the landing site, their velocity at the 0.05-g event and the total duration of re-entry.